Colorado Republican Bob Beauprez 47 percent gaffe: Conservatives think the poor are moochers according to Pew survey. A Colorado Republican was caught on video pioneering the 47 percent slur. 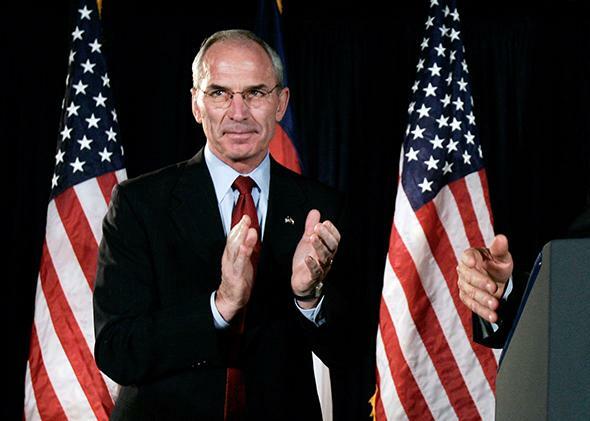 Rep. Bob Beauprez at a reception in Englewood, Colorado, in 2006. “I submit to you that there is a political strategy to get slightly over half and have a permanent ruling majority by keeping over half of the population dependent on the largesse of government that somebody else is paying for,” Beauprez said. Not only does this predate Mitt Romney’s more infamous declaration of class contempt—”[T]here are 47 percent who are with [Obama], who are dependent upon government … who believe that they are entitled to health care, to food, to housing, to you name it”—but it comes almost a year before the meme reached wide penetration among the Republican elite. Of course, it wasn’t long after Beauprez’s speech that the GOP wave and subsequent Tea Party ascension brought the “47 percent” narrative to national audiences. “We’re dismayed at the injustice that nearly half of all Americans don’t even pay any income tax,” said Texas Gov. Rick Perry, announcing his presidential campaign in 2011. “We’re coming close to a tipping point in America where we might have a net majority of takers versus makers in society, and that could become very dangerous if it sets in as a permanent condition,” echoed Rep. Paul Ryan in a speech that same year to the Heritage Foundation. Republicans abandoned this talk after 2012, all but repudiating the Romney approach, which leaned on an agenda of plutocratic policies and class resentment and suffered as a result. But the basic idea—that some number of Americans were lazy “takers” addicted to welfare and entitlements—never subsided. You can see it in the anger over Thad Cochran’s win in the Mississippi Senate primary—with opponents furious over his appeal to so-called “moochers“—and in the backlash to the contraception mandate in the Affordable Care Act; conservatives demanded women “pay for their own birth control,” as if insurance coverage were an unearned benefit. These aren’t isolated views, and they’re reflected in the broader attitudes of conservative Americans. Eighty-one percent of conservatives say that the poor “have it easy because they can get government benefits without doing anything,” and 58 percent say the poor are poor because of “lack of effort.” Both results come from a massive Pew Research Center survey on political typology, which also finds that conservatives—by 84 percent to 11 percent—believe the poor are harmed by government aid. Paul Ryan no longer talks about the safety net “hammock” that “lulls able-bodied people into lives of dependency and complacency,” and presidential contenders like Florida Sen. Marco Rubio have borrowed key ideas from Republican “reformicons” who want to point the GOP toward working- and middle-class concerns. This is good and necessary work, but in gaining steam, it risks angering key parts of the Republican coalition. The simple fact is that, in the Obama era, ordinary Republicans have grown more polarized on everything related to government. Compared to 10 years ago, more Republicans hold deeply conservative political values, more believe “government is always wasteful and inefficient,” and more see compromise as fundamentally undesirable. Attempts to reform the provision of benefits—even in the direction of smaller government—might find hostility from conservatives who see the benefits themselves as the problem. I wouldn’t be surprised if, looking forward, we saw a return to “47 percent” rhetoric from right-wing politicians. The universe of anti-government, anti-“moocher” voters is large enough to matter for elections big and small, and politics—like nature—abhors a vacuum.